I think it is about time that we, the collectors of scale construction equipment, have our own magazine! We want to be the main attraction. Not merely fillers or sidebars in other publications. I have carried this idea around with me for three years. Now I would like to realize this highly collectable publication together with committed collectors and free-lance contributors. 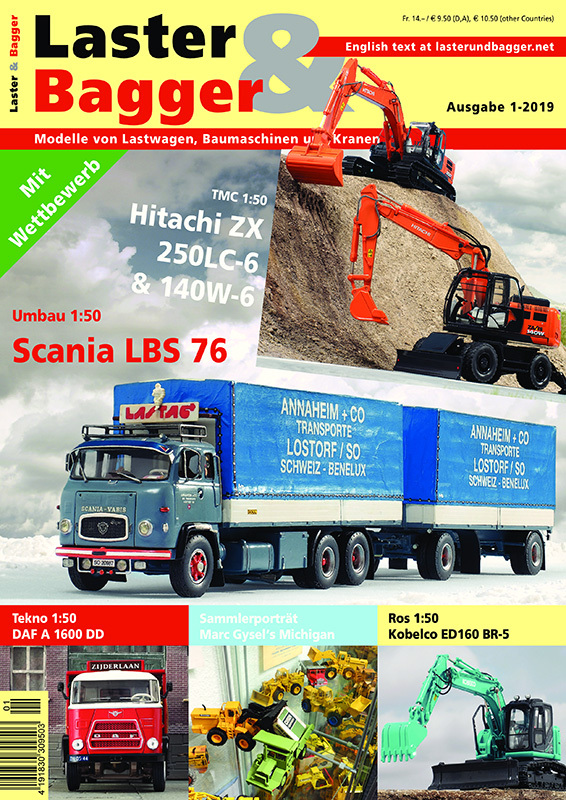 Laster & Bagger is THE full color magazine for collectors of Trucks (Laster) & construction (Bagger) machine models, cranes, Trucks and heavy haulage. The magazine is writen in German. Detailed English translations of the main sections and features for every issue are available on the website and off course also available as App (both iPphone and Andriod) for your tablet, computer or smartphone. We feature the complete panoply of construction industry models: earth moving, tunnel, high rise, road construction, mining, trucks, mobile and construction cranes and heavy duty moving industry. All scales from 1:87 to 1:16 are featured, be it as a new introduction from manufacturers or the model of the month, in dioramas as we showcase collectors. So more content and more reading pleasure! Don’t hesitate to subscribe now! It would give me great pleasure to welcome you as a subscriber and reader. Subscriptions starts with next issue and will be renewed automatically at the end of each year unless we receive a cancellation notice. Yes, I want to subscribe to Laster & Bagger! Comment on articles. Bring your own ideas to us. Help us to improve the design of the magazine. I am happy to receive any and all feedback. Curious? Download the free preview by a click on the photo! Trucks & Construction is available besides Laster & Bagger in English as THE digital magazine for collectors of Trucks & Construction machine models, cranes and heavy haulage. This digital magazine is writen in Englisch and available as App (both iPphone and Andriod) for your tablet, computer or smartphone. Curious? Get your App now!